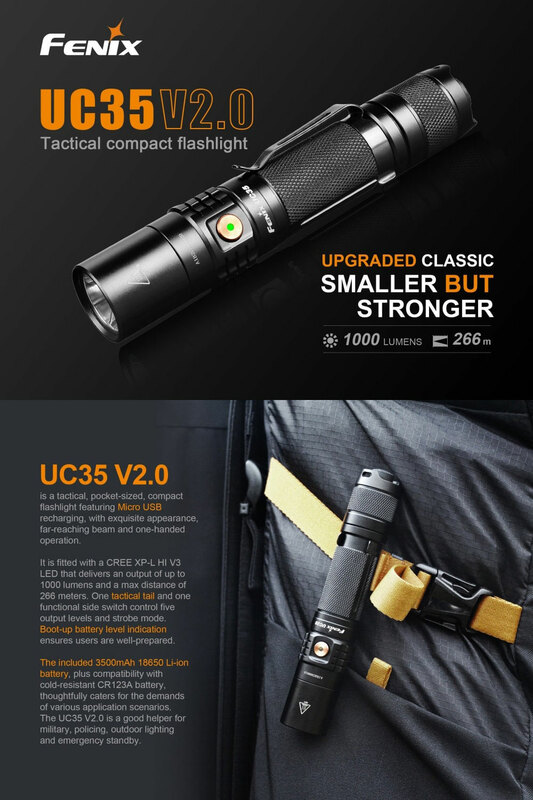 Fenix UC35 has been upgraded and now comes with a second generation version - the Fenix UC35 V2.0 flashlight, it is a pocket-sized, compact tactical flashlight featuring micro USB recharging, with exquisite appearance, far-reaching beam and one-handed operation. It is fitted with a CREE XP-L HI V3 LED that delivers a maximum output of up to 1000 lumens and a max distance of 266 meters. One tactical tail switch and one functional side switch control five output levels and strobe mode. Boot-up battery level indication ensures users are well-prepared. The included Fenix 3500mAh 18650 Li-ion battery, plus compatibility with cold-resistant CR123A batteries, thoughtfully caters for the demands of various application scenarios. The Fenix UC35 V2.0 is your perfect tactical flashlight for military, policing, outdoor lighting and emergency standby. ● XP-L HI v3 LED provides greater brightness, efficiency and throw. ● Improved stainless steel side switch with battery level indicator. ● New body design is more compact. ● Includes higher capacity 3500 mAH rechargeable battery for longer runtime. ● USB port improved to charge faster and is easier to activate. ● Improved waterproof and dust-proof rating (IP68). ● Cree XP-L HI V3 LED, with lifespan of 50,000 hours. ● Powered by one 18650 rechargeable Li-ion battery or two 3V/CR123A Lithium batteries. ● 5V/2A Micro USB rechargeable, included 18650 rechargeable Li-ion battery. ● Battery level indication and low-voltage warning function. ● Digitally regulated output maintains constant brightness. ● Reverse polarity protection to protect from improper battery insertion. ● Anti-roll and anti-slip body design. ● Tactical tail switch features instant activation. ● Functional side switch for output selection. ● Made of durable high-strength and oxidation-resistance aluminum. ● Premium type HAIII hard-anodized anti-abrasive finish. ● Toughened ultra-clear glass lens with an anti-reflective coating. 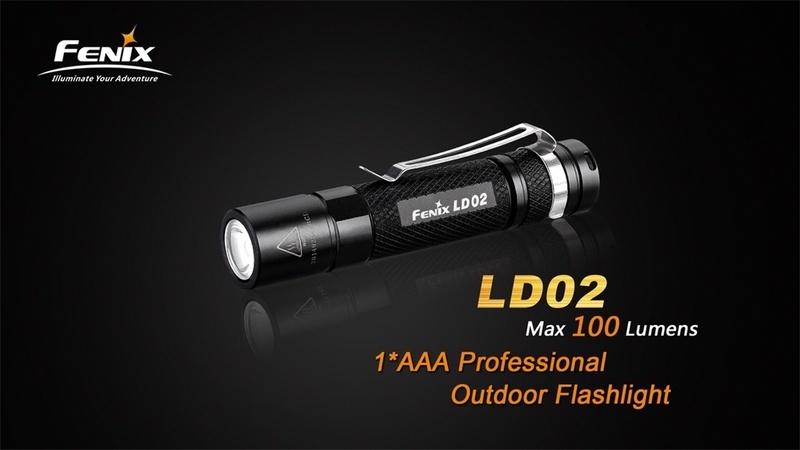 The Fenix LD02 flashlight is an AAA-powered flashlight in Fenix's legendary LD series. Its compact power source makes for a compact device that can go with you anywhere you need it. Whether you're hiking through the back country or navigating the urban jungle, you're sure to be in countless situations where a powerful flashlight will get you out of a jam. Ultra-tough construction ensures you can rely on this light when you need it most. ● Cree XP-E2 LED with a lifespan of 50,000 hours. ● Three modes of operation. - High: 100 Lumens (45 min. using Ni-MH battery; 30 min. using Alkaline battery). - Mid: 25 Lumens (4 hr. 15 min. using Ni-MH battery and Alkaline battery). - Low: 8 Lumens (14 hr. 30 min. using Ni-MH battery and 15 hours using Alkaline battery). ● Digitally-regulated output: maintains constant brightness. ● Broad beam lens provides soft, even beam for close-up illumination. ● Push-button tailcap switch for one-hand operation and output selection. ● Made of durable aircraft-grade aluminum with rhombic knurling. ● Premium type 3 hard-anodized anti-abrasive finish. ● Waterproof to IPX-8 standard (under water up to 2 meters). 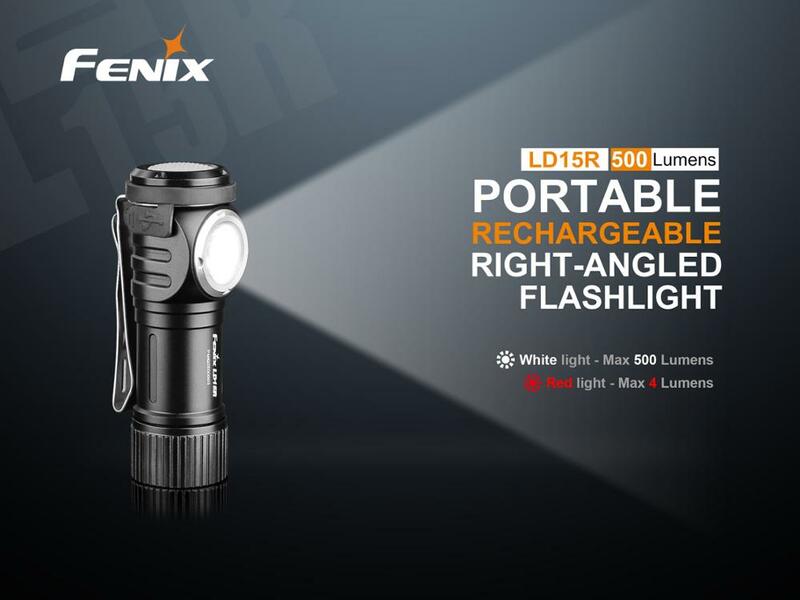 Fenix LD15R flashlight is a compact and handy right-angle flashlight with dual light sources: white and red lights. Powered by one 16340 rechargeable Li-ion battery, it is also compatible with a cold-resistant CR123A battery. The large pushbutton switch located on the top of the light makes for easy operation, it delivers a max output of 500 lumens and a max beam distance of 85 meters. Featuring four white and three red light output levels, plus Micro USB charging, battery level indication, two-way body clip and a magnetic tail, the LD15R will be a good aide for repair work, outdoor activities and daily use. ● Cree XP-G3 white LED with lifespan of 50,000 hours. ● Maximum beam range of 278 feet in Turbo (85 meters). ● Waterproof (not dive rated). ● Powered by one 16340 rechargeable Li-ion battery or CR123A Lithium battery. ● 5V/1A Micro USB charging, 1.5 hour charging time. ● Two-way body clip and magnetic tail. ● Low-voltage warning reminds when battery replacement is needed. ● Constructed of aircraft grade aluminum with premium type HAIII hard-anodized anti-abrasive finish. ● Fitted with high quality optical lens. ▹ Brightness drops to 200 lumens after 5 consecutive minutes in Turbo. ▹ From off, click the switch; indicator will show battery status for 3 seconds. ▹ Press and hold switch for 0.5 seconds for on or off. ▹ From on, quick press to change brightness level. ▹ Press and hold switch for 1.2 seconds for red. 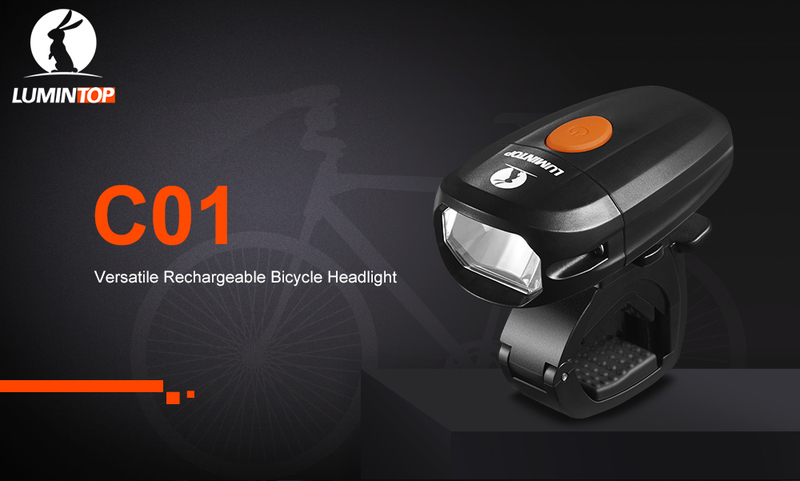 Lumintop C01 bicycle light is a versatile rechargeable bicycle headlight, which designed for urban cycling commuting. By adopting the anti-glare multi-faceted reflector, it produces a equal ray, takes care of near and distance illuminations. At the same time, it prevents dazzle to the on coming people and vehicles. Utilizes Cree XP-G3 LED with neutral white color, it has better penetrability, even in rainy and foggy weathers. Three general output levels plus Strobe, SOS, and Beacon with a max output of 400 lumens, it meets the commuting and daily lighting demands. The built-in 1,400mAh high-capacity lithium polymer battery provides a maximum runtime of up to 10.5 hours which meets long-distance cycling requirements. Micro USB direct charging function allows you to charge the light at any time to ensure a sufficient power of your ride. Charging indicator, low-power warning, quick-release structure, IPX-8 waterproof design etc., C01 is your reliable partner in daily commuting, road riding, or in daily use. ● Utilizes Cree XP-G3 neutral white LED with better color rendering and a 50,000 hours lifespan. ● Six output levels with Low, Medium, High, Strobe, SOS and Beacon, max 400 lumens. ● Built-in 3.7V/1400mAh Li-polymer battery, provides a 10.5 hours max runtime. ● Micro USB rechargeable with charging indicator. ● Featuring low power indicator and intelligent output downshift function. ● Tapered surface reflector designed with German standard, reduce the hazard of glare to oncoming people. ● Detachable and adjustable bike mount, fit for 19-33mm diameter bicycle handlebar. ● 360-degree rotatable on the mount allows easily to adjust the shooting direction. ● One switch for fast and easy operation. ● Versatile to serve as a bicycle light and handheld flashlight. ● Made of high-intensity ABS materials, solid and lightweight. ● IP68 rated protection, 1.5 meters impact resistance. Tank007 EC01 flashlight is a powerful mini USB rechargeable flashlight, it is powered by one 16340 battery and can throw light up to 400 lumen. 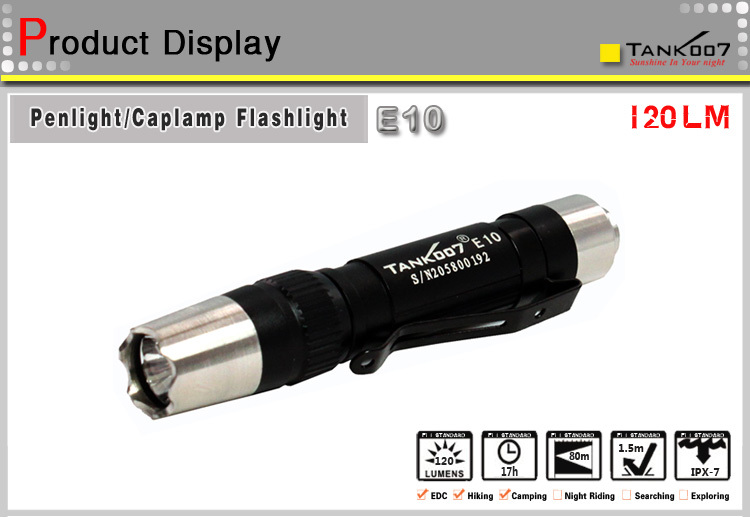 This flashlight is good for outdoor activities like campint, hiking, riding, etc.. In addition, thanks to the bright light, it is also a good self-defensive tool for girls who often go out or walk home alone. As a magnetic flashlight, it can be a good help when you need to repair your car or do something else. ● With charging indicator, red light displays during the charging process and green light when fully charged. ● Circuit board with memory function, so it can effectively remember each mode. Users can manually switch different modes. I like the Tank007 EC01 a lot, but the dimensions that Tank007 gives are wrong (the length is not 124mm but clearly shorter, and I expect the diameter a bit slimmer than 24mm). Could you measure the true dimensions of the EC01 for me? I like the Tank007 EC01 a lot, but the dimensions that Tank007 gives are wrong (the length is not 124mm but clearly shorter, and I expect the diameter a bit slimmer than 24mm). Could you measure the true dimensions of the EC01 for me? The dimensions is 74.5mm (length) * 20.4mm (diameter) * 20.4mm (head diameter). Tank007 E10 flashlight is a powerful outdoor mini flashlight that can power up to 120 lumens. Mini of light weight and small size, convenient for outdoor activities, it is a very practical addition to any pocket. Head, tail and tail cap are made of 304# stainless steel, combined with the black color of aluminum body, the flashlight looks extraordinary. 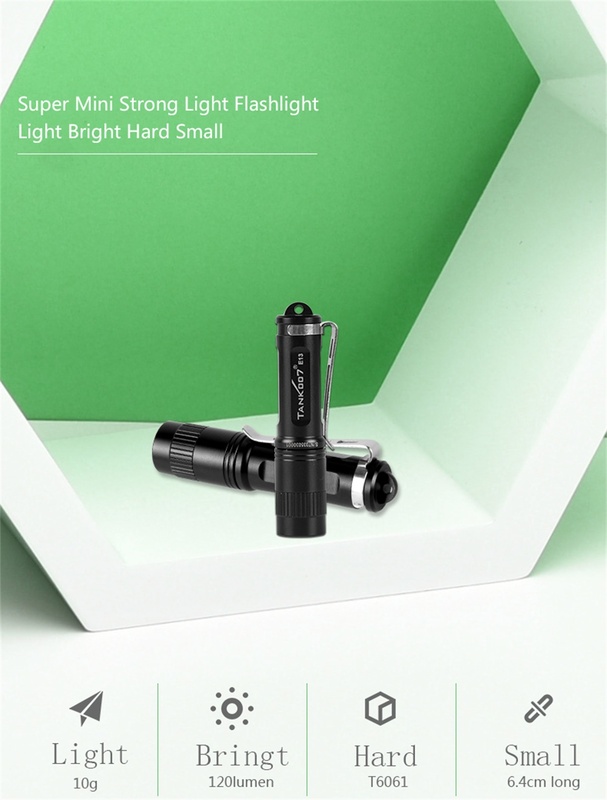 ● Mini flashlight of light weight and small size working with only 1xAAA battery. ● Head, tail and tail cap are made of 304# stainless steel, combined with the black color of aluminum body, the flashlight looks extraordinary. ● Stainless steel tactical head which can be used for glass breaking. ● End click switch, convenient and practical. The flashlight can stand on tail. ● Bio-direction pocket clip can work as penclip or capclip under different circumstances. ● Three lighting modes for use in different circumstances. ● Constant current circuit chip for constant brightness. 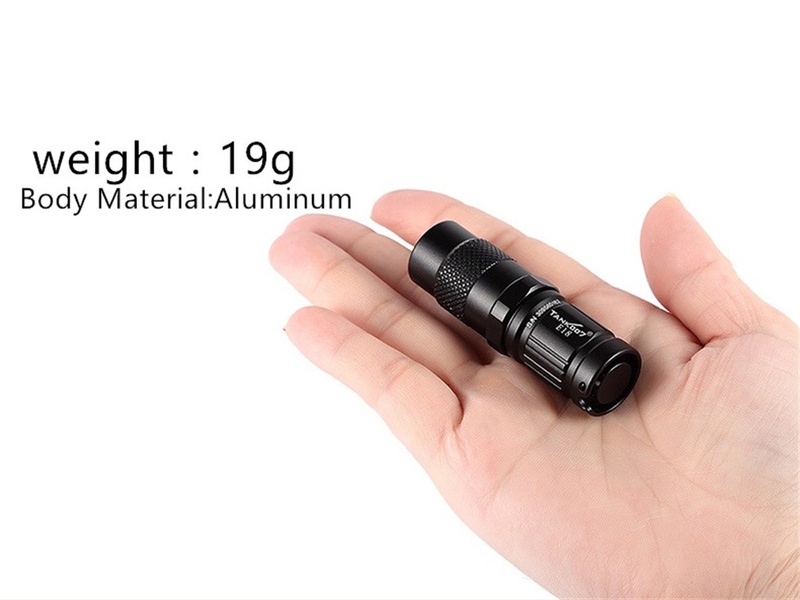 If you think that a flashlight over the size of palm is a burden for you, then this mini flashlight will be a great choice. It satisfies your general demands for flashlights with its small body. If you don't want to spend too much money on a flashlight, it just happens to meet your need. With the price of $24.88 at GearVita.com, it is really your helpful small assistant for outdoor activities. The Tank007 E18 flashlight is an ultra compact everyday carry torch which can deliver up to 180 lumens on the highest setting. It can be powered by one CR123A lithium non-rechargeable battery, or one 16340/RCR123A rechargeable lithium-ion battery. Two brightness settings and strobe are available, which are cycled through using the simple twist switch head of the torch. The tempered optical lens lens that sits in front of the Cree XP-G R5 LED combined with the orange peel aluminium reflector provides a beam range of up to 100 metres. Weighing only 19 grams and measuring 65 mm in length, you won't even notice you've got this handy piece of kit in your pocket. ● Candle finger-sized, very convenient to carry on with a keychain, when you travel, outdoor, camping ect. ● Using aluminum material, it is non-slip, waterproof, and abrasion resistance. ● Powered by 1*CR123 or 1*16340 rechargeable battery. ● LED will give you stable and bright light, nonthermal radiation, safe and reliable. ● Anti-slip pattern on the light head, convenient to secure grip and switch mode. ● Head rotation switch, which is durable and easy to operate even with single hand. ● Six square light anti-roll body, it will not roll on flat surface. ● Capable of standing up securely on a flat surface to serve as a candle. ● Constant current circuit chip maintains constant brightness. ● Waterproof to IPX-8 standard, anti-drop height is 1.5 meters. ● Three modes of lighting can be applicable to your lighting requirements for different environments. ● Mode selection: rotate head repeatedly to select the mode needed. Then light memorizes the last mode which continued for at least 2 seconds. For example, when you switch the mode to low light, keep it for at least 2 seconds, and then restart the flashlight, you will get the low light again. 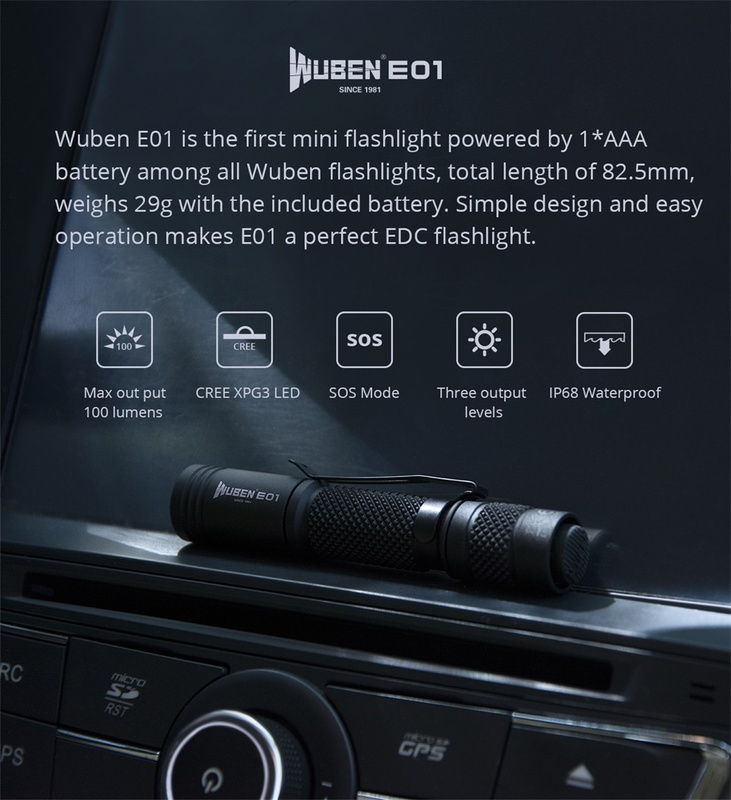 Wuben E01 flashlight uses aluminum alloy material, it is non-slip, waterproof, and abrasion resistance. It utilizes Cree XPG3 LED, powered by AAA battery, with 3 output levels, maximum 100 lumens, all controlled by the tail switch. High, medium, low, SOS, four modes, so many brightness options are convenient for us. LED will give you stable and bright light, nonthermal radiation, safe and reliable. It is suitable for camping, fishing, hunting, hiking, searching, working. way too long for a 1xAAA! Tank007 PT12 flashlight is a high power tactical LED flashlight with high brightness and medium volume, suitable for military, police, seaqrching, outdoors, camping, riding, etc. Powered by high power Cree XM-L 2U2 LED with life time 100,000 hours, relatively longer burning time can meet you long time lighting need. With a specially desgned stainless steel attack point at the tail, you can broke glass and other objects to save you in emergency. Anti-incorrectly inserting battery design can protect the flashlight, even the battery is incorrectly input, the flashlight do not get hurt. ● Made of durable aircraft-grade aluminum T6061. ● Premium Type III hard-anodized anti-abrasive finish. ● Relatively longer burning time can meet you long time lighting need. ● With a specially desgned attact point at the tail, users can broke glass and other objects to save themselves. ● Orange-peel reflector, high efficiency, perfect even spot. ● Scientific structure design, exqusite workmanship. ● Constant current circuit chip to maintain stable and continuous brightness. ● The circuit uses anti- incorrectly input battery so as to protect the flashlight. ● High power Cree XM-L 2U2 LED, with life time 100,000 hours. Tank007 UC17 flashlight is a stylish and compact rechargeable flashlight. 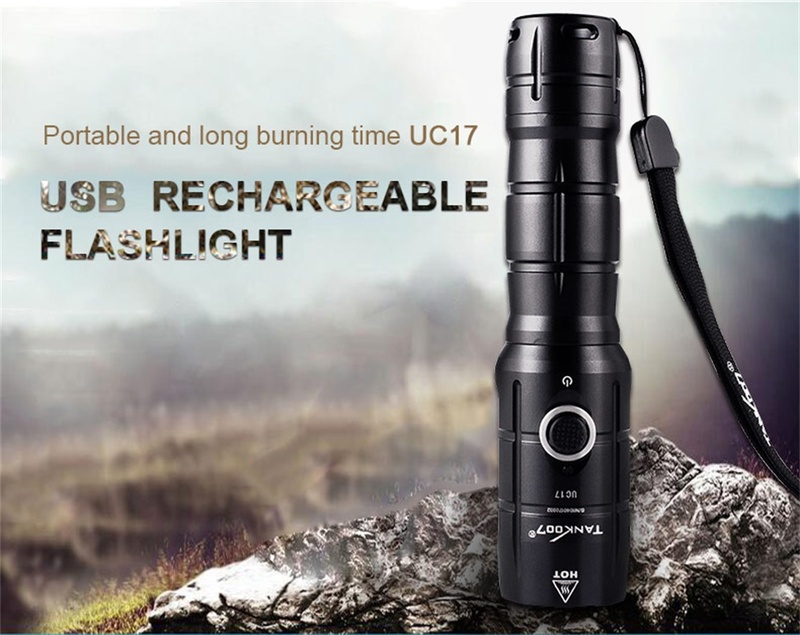 Only with a 18650 battery achieving 800 lumens of brightness and a range of up to 300 meters, UC17 will meet your needs such as camping, riding, and searching etc. In addition, with 5 model of high med and low strobe SOS, it could suit for everyday lighting perfectly. It can also be used as a mobile power source to provide powerful lighting support for outdoor travel and emergency. With anti-slip texture and prevent overheating design, you will love with this exquisite fellow. ● Charging with indicator function, red is not full of electricity, green represents a full charge. ● Constant current circuit chip for constant brightness. The flashlights has memory function to memorize the last mode. ● Max 800 Lumens, can meet the requirement of high power lighting. ● The United States imported Cree new generation of LED lamp beads, energy saving, life of 100,000 hours, brightness of 800 lumens, battery life of up to 30 hours, meet your lighting needs. ● Constant current circuit chip which maintains constant brightness. ● Head rotation switch, which is durable and easy to operate. ● 5 modes of lighting can be applicable to your lighting requirements for different environments. ● Powered by 1 x 18650 2600mAh rechargeable battery. ● IPX6 waterproof design, can satisfy daily waterproofing requirements. ● Intelligent memory gear position automatically remembers the gear position when it was last turned off. ● Body is light and compact, the distinctive head button design makes it easy for you to control with one hand. Tank007 E13 flashlight is a mini portable led keychain flashlight with pocket clip provided, weighs only 10g, very easy to carry everywhere, can be used as an emergency light. It is powered by 1*AAA battery, which is easily obtainable, but with 120 lumens brightness. It is switched on by simply revolving the head, with one mode design, easy to operate. Tank007 E13 is well protected, resistance to falling and waterproofing are inherent characteristics. 1*AAA battery is enough to make it last more than 1 hour of lighting. Especially small, such as the usual small clips. If you go out or camp, it is very convenient to hang on the bag. E13 is a very small flashlight, like keychain. LED will give you stable and bright light, nonthermal radiation, safe and reliable. It is powered by 1*AAA battery, which is easily obtainable, but with 120 lumens brightness. Keychain and clip can attach E13 to pocket, bag, belt, hat or anywhere you want. It is switched on by simply revolving the head, with one mode design, easy to operate. It is suitable for camping, fishing, hunting, hiking, searching, working. Thanks to its much portable feature, it can be with you anywhere to work as an emergency light. 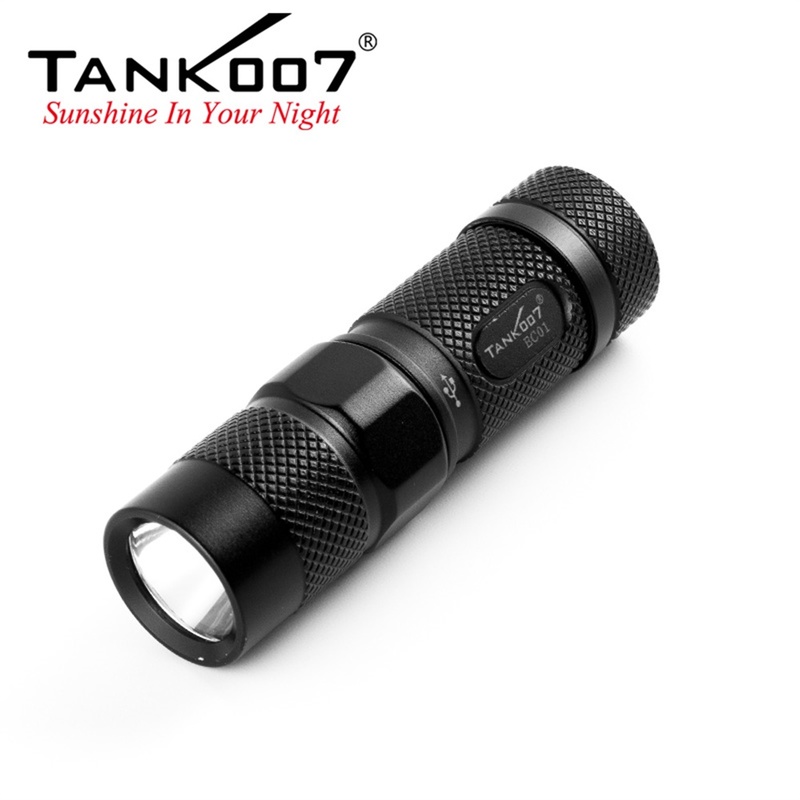 Tank007 PA01 flashlight is a mini portable flashlight with pocket clip provided, which has finger size, short and exquisite, easy to carry everywhere. It is powered by 1*AAA battery, which is easily obtainable, but with 90 lumens brightness. Professional and user-friendly design make you comfortable and convenience. 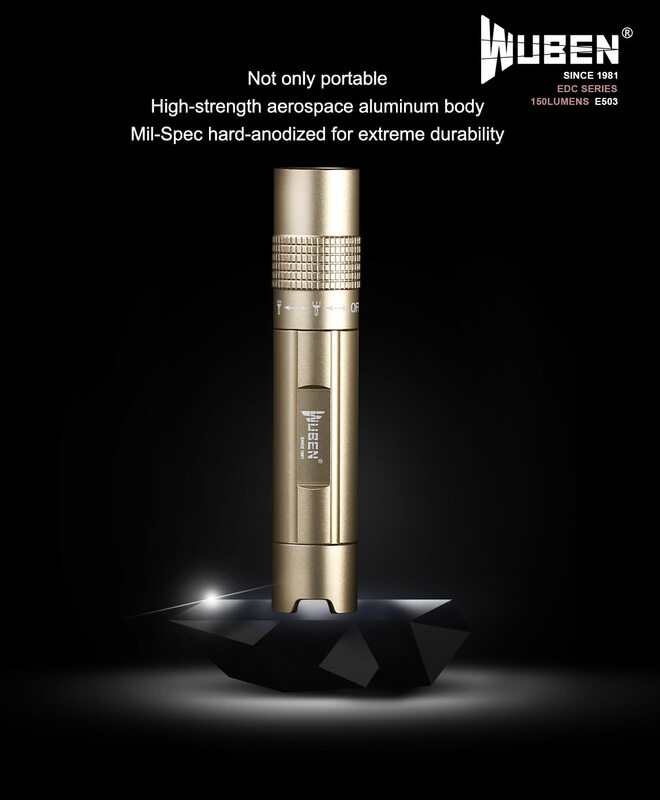 ● Tank007 PA01 is a portable mini penlight working with only 1 x AAA battery, with waterdrop shape knurling in the tube, natural and beautiful. ● Adopt the Hard-anodized to finished the body, which makes it hardly to be scratched or faded. ● One mode or three modes for your choice, constant current circuit chip for constant brightness. ● End clicky switch with feel comfortable. ● With a pocket clip, it be can be put in your pockets, which is very convenient to carry. ● Unique golden ring embedded in the connection between battery tube and the tail part, harmonious, graceful and royal. ● With diffusers specially designed, it can work as a camping lamp, signal stick or bracket light. ● Very brightness with a small size, a good choice for no matter outdoor or home use. I have copied the “quote” from above the OP, so technically is was not in previous post. And there was no mentioning of using it as a caplamp in the post before this one. But: how can we use it as a caplamp, when there is only one groove in the body: at the tail side. 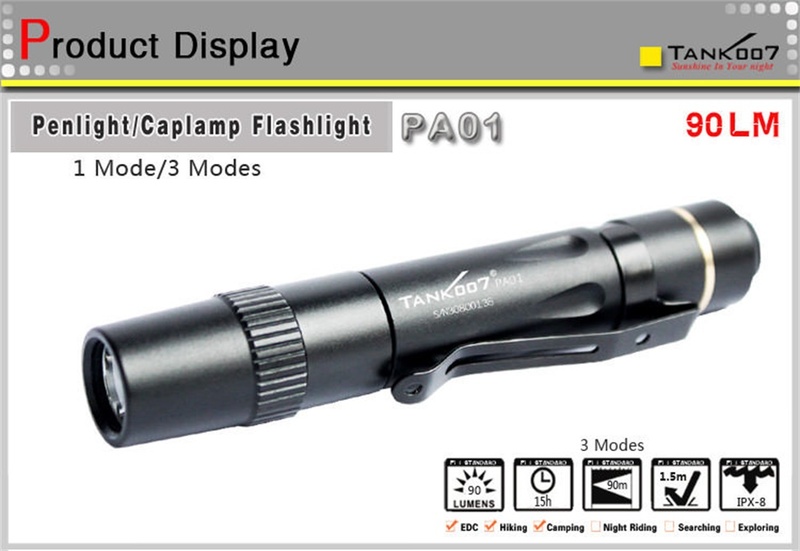 The bio-direction clip makes the flashlight a caplamp or pen light, Tank007 official website is written like this. I’ve read that. Question remains: is the body reversible? Because there is only ONE groove for the clip. I've read that. Question remains: is the body reversible? Because there is only ONE groove for the clip. This clip is bidirectional, which means that the grooves at the head and tail are all available as clips, so that the body don't need to reverse. I think this sentence should mean this although I don't know if this is feasible. 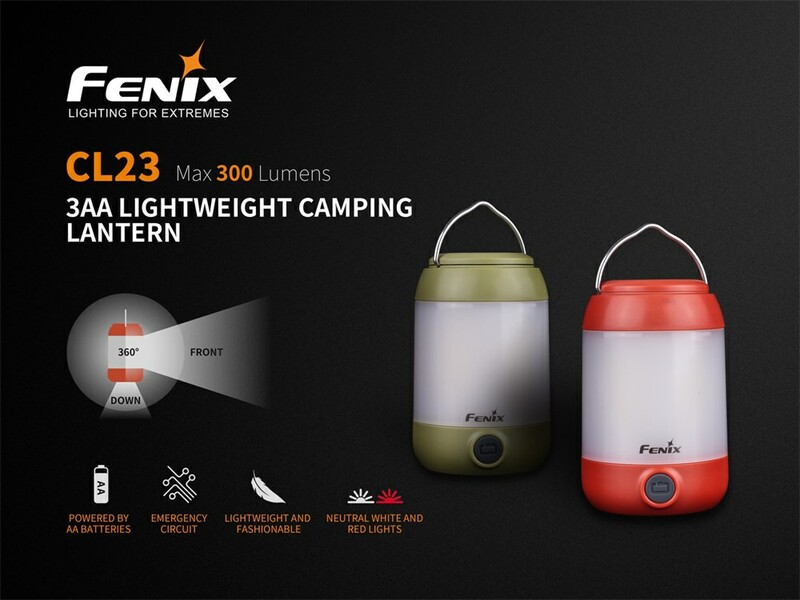 The Fenix CL23 is the first multi-directional camping lantern from Fenix. It provides impressive power, with a max output of 300 lumens. This new camping lantern is powered by 3 AA batteries, however, in emergency situations it can be powered by 1 or 2 AA batteries. Featuring compact size and a light weight, the lantern not only delivers the needs of campers but also satisfies backpackers' requirements. The multi-directional design is great for both camping outside or for inside of your tent. With good-looking appearance, IP66 rated protection and multiple ways of wearing, the CL23 will make for a stylish and more enjoyable outdoor life. The Fenix LD05 V2.0 flashlight is a easy to use dual lighting source penlight with warm white light and UV lighting also. The all new Fenix LD05 V2.0 uses a 90 CRI CREE XQ-E HI LED and a 365nm UV LED. Operating the Fenix LD05 is simple, the stainless steel tail switch controls all three warm white light outputs and the UV light output. A single click turns the Fenix LD05 on, and half clicks allows you to increase the outputs. The Fenix LD05 V2.0 is powered by two AAA batteries which deliver an amazing 100 Lumens of output. This light is perfect for doctors and dentists as well as helps with medical inspections in low-light areas, the powerful UV light also provide easy detection of counterfeit currency. The Acebeam PT10 penlight is ideally meant for use by Law Enforcement professionals, mechanics, and as a general-use EDC, due to its small size and bright output. 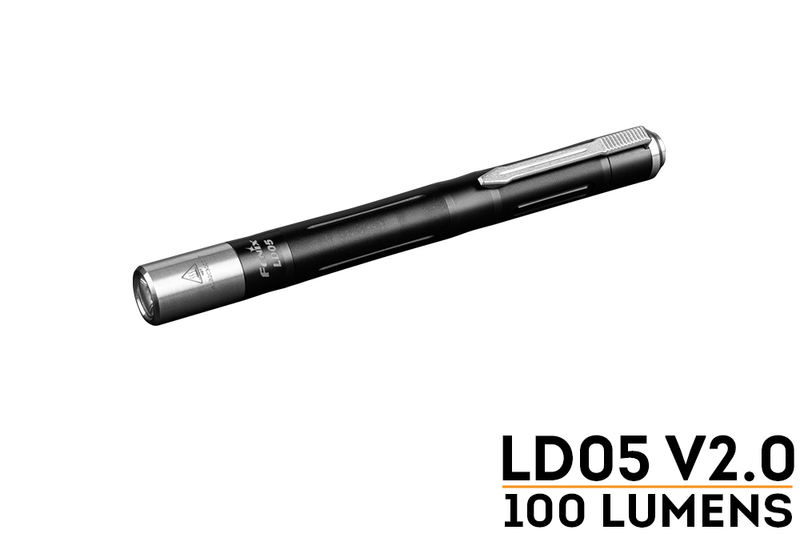 This handheld flashlight, though it measures just over five inches long, which is about the same as an average-sized pen, offers an incredible 360-lumen High mode. Compare that with other 2 x AAA penlights and you'll quickly see that the Acebeam PT10 is clearly the brightest of the bunch! This LED penlight is equipped with a Cree XPL-HD LED, which delivers the latest in illumination performance and efficacy. Over time, Cree has developed and optimized their lamps to deliver the most amount of lumen output from the smallest-sized lamp possible. 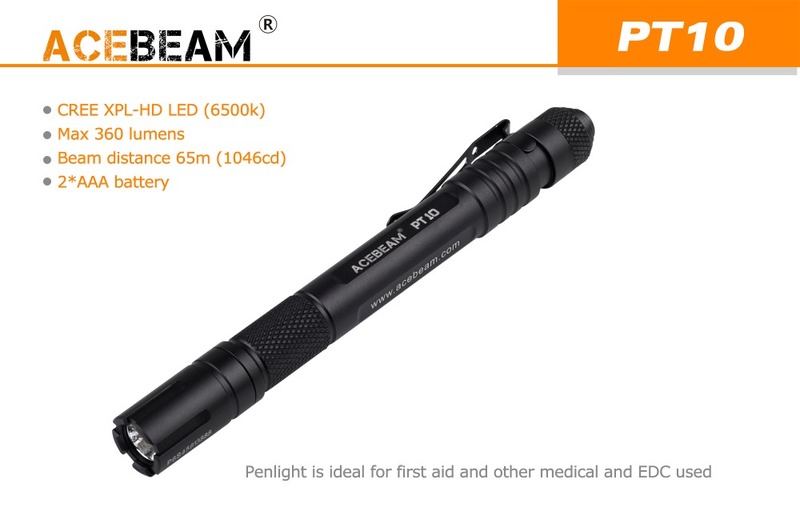 The Acebeam PT10 runs on two AAA batteries, which power the LED penlight for approximately 48 minutes, when in High mode. If longterm use is your focus, you'll be happy to learn that this flashlight can run for 10 hours in Medium mode (30 lumens) and up to 36 hours in Low (3 lumens). ● Durable aircraft grade aluminum construction. ● Toughened ultra-clear glass lens with anti-reflective coating. ● Copper base plate for more efficient heat distribution. ● Orange-peel reflector broadens the beam throw. ● Tail switch on/off push button for one-handed operation. 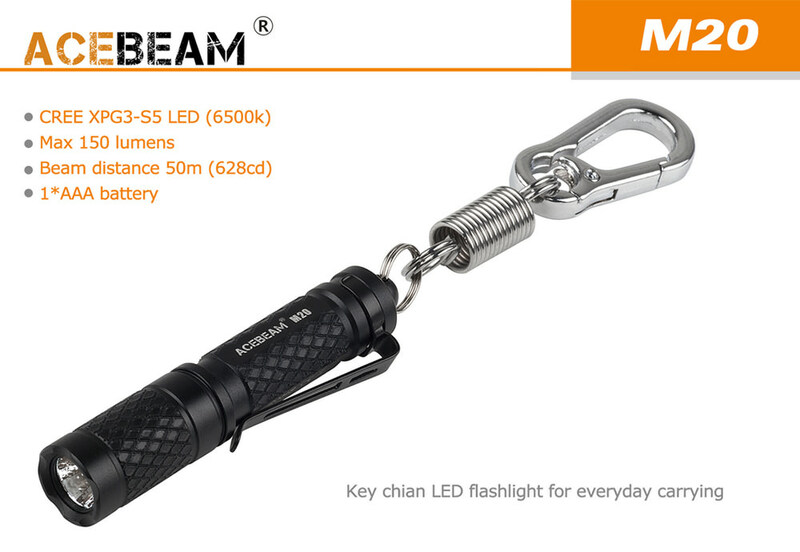 Acebeam M20 flashlight may not be the biggest, but it is a high-powered keychain flashlight and lives up to Acebeam's legacy of quality products. Featuring a CREE XPG3-S5 LED and powered by a single AAA battery, this diminutive dynamo can produce up to 150 Lumens of incredible light output. An intelligently designed and highly efficient printed circuit board improves the performance of the equipment and maximizes its operating time, automatically providing protection against damage caused by high temperatures. By twisting the light head, you can select middle, low and high three unique lighting modes rapidly that can adapt to indoor or outdoor use. With the included keychain mount the Acebeam M20 can be hooked to any set of keys or even clothing for a portable hands free carry, it is your ideal partner whenever and wherever you need light. ● Use CREE XPG3-S5 LED light temperature of 6500K, maximum brightness of 150 lumens, maximum intensity of 628cd, wide beam of 50m, LED life of 50,000 hours. ● Crafted from durable, lightweight aircraft grade aluminum. ● Premium type III hard-anodized anti-abrasive finish is hard-rusted, heat-resistant. ● 2mm toughened ultra-clear glass lens with anti-reflective coating reduces glare, provides 98.3% light transmission evenly at all brightness levels. ● Special gold-plated contact system for maximum power impact strength of 1.2m. ● Waterproof to IPX-8 standard at 2 meter depth. ● Copper base plate for efficient heat management. ● Moderately texturing finished reflector disperses light for a smooth, even beam. ● High-performance circuit design, low power consumption, voltage 0.9 - 1.5V, use AAA alkaline batteries. ● The ability to stabilize the flashlight on a flat surface to fulfill the role of a candle. The Tank007 F2 flashlight is a great practical light with special feature of double LEDs for both white light luminating and UV light. There are one white high power 3W LED and one high power 1W UV LED in its head. The maximum white LED output is 160 lumens and the range is 130m and the UV LED operates at a wavelength of 365 nm. The white light is used for portable lighting and the UV light is used for fluorescence detecting, application mainly in banking, police, metallurgy, jewelery, antiques, etc. The exception of the Tank007 F2, except for the use of 2x LEDs, is that it is focussed and very small dimensions. The luminaire features a simpler focusing (zoom optics), and with one finger in a second, you change the light beam scatter. There is an aspherical lens in the head. By shifting the head, the light cone can be concentrated to a small square to achieve an excellent long-lasting lighting to light far distance, or extend the light cone into a very wide, uniformly illuminated circle without focus, which is suitable for illuminating the wide space in the vicinity. Control of the lamp is secured by the rear switch. Using a hanging clip, you can hang the light on your pants pocket, the shirt pocket. It can be focused and zoomed, concentrate light to light far distance and cover large space with flood light. Small size with metal pocket clip, easy to carry. Powered by one ordinary 1.5V AA battery or NI-MH battery, which are easy to get. Designed with the button switch on the tail, easy to operate making it have tactical feature. 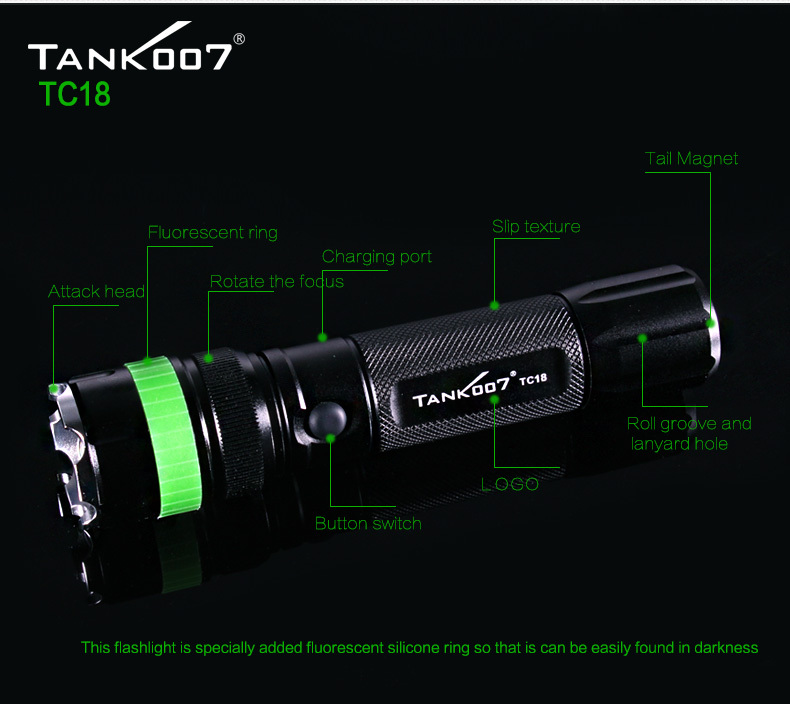 Tank007 TC18 flashlight is a high power and brightness multi-functional rechargeable LED flashlight. 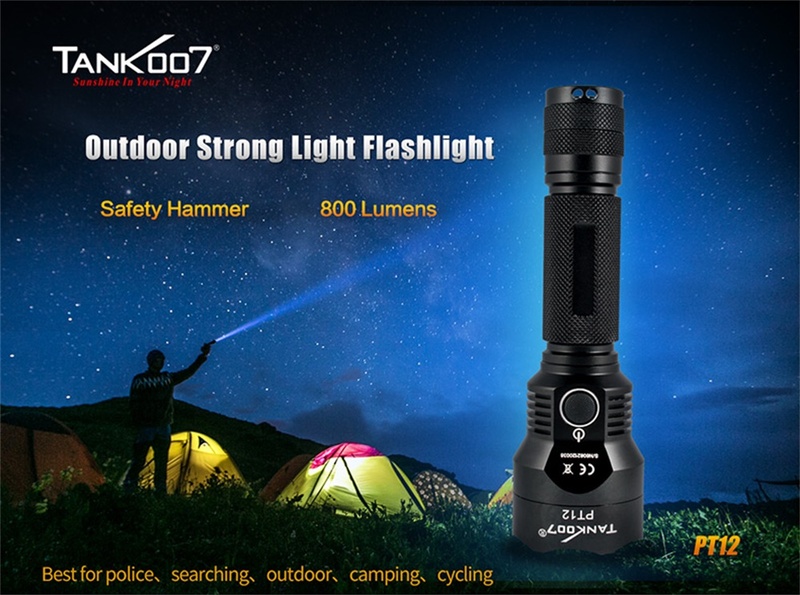 It is powered by 3 AAA battery or 1 x 18650 rechargeable battery and features focusing, directly charging, and magnet and is designed and manufactured according to Chinese police flashlight standard, best for military, police, outdoor searching and rescuing, camping, vehicle and machines maintenance and repair. The flashlight is with a 350 lumen output and 400 meter range is focused. It has three flash and two flash modes, the battery can be charged directly in the lamp body. It also can be used as a backup power source with a charged battery. ● Tank007 TC18 can concentrate light to throw long beam as well as light close in wide angle. ● There is a high power LED light in the middle surrounded by three red, green and blue different color lights, which can meet some special requirement. ● The equipped signal diffuser can turn the flashlight to a signal lamp easily. ● With the white diffuser, it can be used as a table lamp for repair, camping and so on. ● Thanks to the magnet in the tail that can be strongly absorbed to metal surface, it can easily be fixed when users need to repair vehicles, machines, elevator, etc..
● Attack head can be used for self-protection in emergency, which can easily break automotive glass. ● This flashlight is specially added fluorescent silicone ring so that is can be easily found in darkness. ● No need of removing battery for charging for it support directly charging and charging in the car. ● This TC18 is also a power bank which can charge mobile phones, cameras, and other products. ● With battery box, this flashlight can use three AAA batteries as power source. ● Five modes to adjust the lighting type can meet different lighting needs. ● IPX7 waterproof design, suitable for hunting, cycling, climbing, camping and other outdoor activities. ● It is super bright maximum 350 lumens and has strong power, the throw beam can be up to 300 meters and the light still not be reduced. You went on a trip and you have a weak smartphone - no problem if you have the Tank007 TC18 that purchased from GearVita handy! Complete with a flashlight is an adapter and a USB cable, thanks to which you can recharge your gadget directly from the lithium battery of the flashlight. Have you decided to have a dance party? Tank007 TC18 will be very useful, it's not just the presence of the strobe mode. In addition to the main LED, 3 additional color LEDs are installed in the flashlight - red, green and blue, which simulate light-emitting music in one of the flashlight modes. 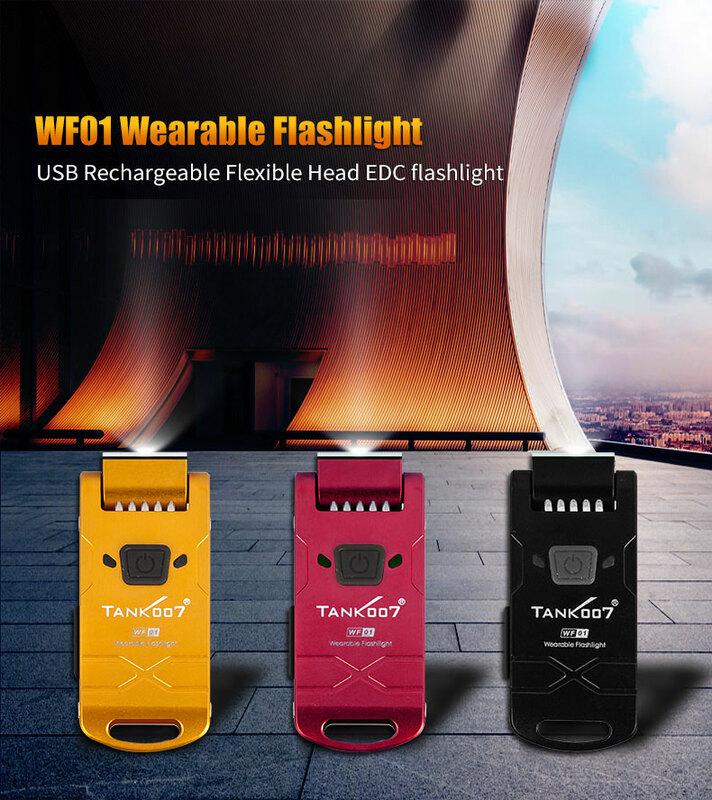 Tank007 WF01 flashlight is a compact and portable flat wearable lamp, which can be rotated 180 degrees, easy to adjust the light direction, in small size like a lighter. The body comes with a metal clip, easy to use and to carry in a variety of ways. In addition to holding in hand, other using methods including but not limited to hanging in the neck lighting, clamping hat brim, badges, pockets, belts, etc. ● 180 degree lighting to adjust beam direction to meet different needs. ● The size is as small as a lighter, convenient to carry. ● Tank007 WF01 comes with a metal clip, easy to use and various ways of carrying. ● Built-in high-energy polymer battery, which can be charged through the micro-USB port from the side. ● Built-in charge protection circuit which can stop charging in case of over discharge, overcharge, short circuit to further protect the battery. ● With memory drive circuit, the flashlight can remember commonly used modes. ● Comes with low power indicators, the red light flashes 3 times every 3 seconds at the frequency of 3Hz in the on-state when the power level is lower than 10 percent. ● Can be used as a signal light, double-click switch to turn on the signal light when the light is off, the red and green light will flash in turns. Click the switch once to power off the signal light. This can facilitate to find the flashlight in the dark (if the signal lights are in work process, click the button to exit the flash mode). ● When the flashlight is powered on, each time the power indicator is flashing, it indicates the power level - 100 percent flash 5 times, 75 percent flash 4 times, 50 percent flash 3 times, 25 percent flash 2 times, less than 10 percent does not flash. ● Suitable for camping, fishing, hunting, hiking, searching, working. Wuben E503 flashlight is a mini portable keychain flashlight, with pocket clip provided, easy to carry everywhere. It an be used as an emergency light, powered by 1*10440 battery, with 150 lumens brightness, max 60m brightness distance brings further bright distance. It is switched on by simply revolving the head, with one mode design, easy to operate. With the waterproof design, you don't need to worry about rainy days, it is a great tool for people who needs to go out in the night. ● Wuben E503 adopts 6061-T6 high quality aerospace aluminum material, solid and durable for use. ● Mil-Spec hard-anodized for extreme durability. ● Adopts latest CREE XP-G2 LED as light source to bring super high brightness, up to 100,000 hours lifespan. ● Up to 150 lumens output and up to 60m beam distance, you can see clearly in the dark night. ● Powered by one 3.7V 350mA 10440 lithium-ion battery. ● Battery is rechargeable circuit design. ● Micro USB general charging connector with charging indicator function. ● ATR technology can regulate the temperature to prevent overheating from your flashlight. ● IPX-8 waterproof level, no worry about the rainy days, 1.5m impact resistance to suit for harsh environment. ● Toughened ultra-clear mineral glass lens with anti-reflective coating bring up to 99% light transmittance. ● Two setting modes, low light and high light to meet your needs. Just twisting the head switch to change the mode, easy to operate. ● Tighten the head to turn on the light, fully tighten to max output, loose the head to turn off. ● Chic and compact, only 25g, easy to carry, you can put it into your pocket or bag. It does not matter when and where you need a flashlight. At the party, you can create an open flashlight atmosphere. At night, you can turn on the flashlight to light up. During the day, you can be used for decoration is very beautiful. 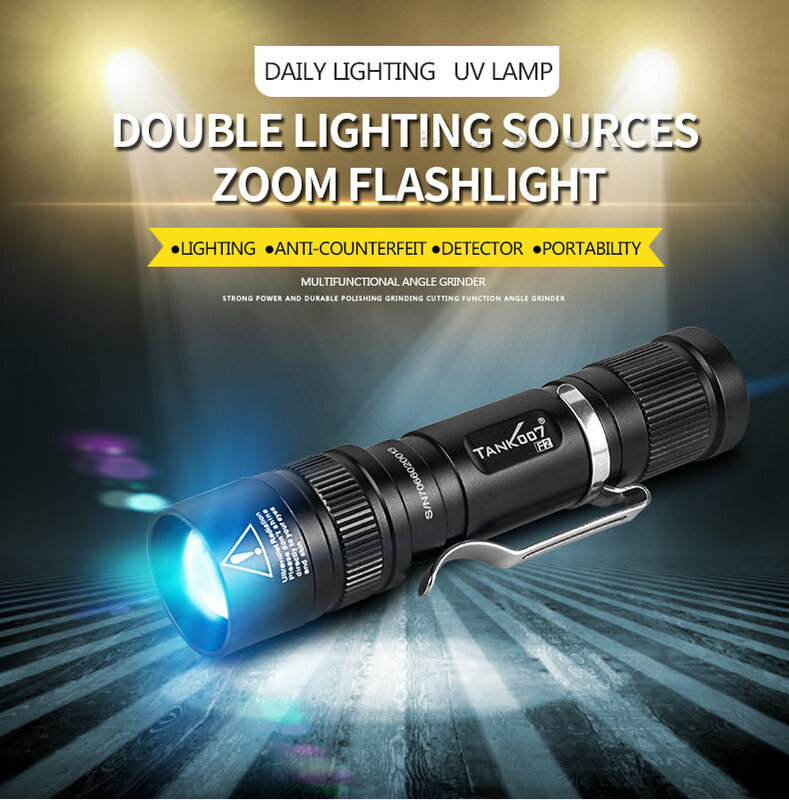 Such a practical and cheap flashlight, don't you hurry to buy it on GearVita? Go lightweight with the new Nitecore LA10 CRI flashlight. This innovative camping light is incredibly compact, weighing only 2 oz, after battery installation. Despite it's petite size, this light packs an impressive 85 lumens of brightness and up to 11 yards of illumination with a Nichia NVSL219B LED designed to enhance natural color. With added functionality such as the lanyard for hanging, magnetized tailcap for added convenience, and a retractable diffuser for compact transportation and storage, this light is the perfect addition to your camping gear! Whether going out into the back country for an extended expedition, car camping over the weekend, or using for night photography or light-painting, this light is a great tool you'll want to keep on hand! ● The body is constructed from solid and lightweight aluminum ally, protecting core components from damage. ● Nitecore LA10 CRI Utilizes a high CRI Nichia 219B LED outputting 85lumens with effective illuminated area of 10m. ● Color Rendering Index (CRI) of 90 which accurately resembles natural sunlight to reveal every subtle detail of an object. ● Three brightness level (high/mid/low) and 1 special mode available for you to choose, meet your different demands. ● Magnetic tail cap with tail stand capability allows for quick attach to metal surface. ● Lipstick-shaped body is just the size of thumb, with a lanyard, making the light extremely easy to carry. ● Built-in retractable diffuser for 360 degree flood illumination, made from high transmittance material, it is capable of bringing out smooth and soft light. ● Flashes light once at a regular interval to mark the location while optimizing battery life. ● Powered by 1 × AA battery with maximum runtime of 23 hours. ● Water resistant with the rating of IPX6, which can protect from heavy splash and rain, impact resistant to 1.5 meter. ● Easy to use twist interface. ● Rotate the tail cap to switch on/off or adjust brightness levels. Olight is celebrating their 10th birthday with a present for its customers - the Olight ION flashlight, one of the most unique and stylish pocket-sized lights we've ever seen! This box-shaped light features a one-of-a-kind body design never before seen in a flashlight, crafted from durable gorilla glass with a sturdy titanium frame. No bigger than a Zippo lighter, this compact torch comes with a detachable key ring for easy fastening to your keychain, making it an ideal EDC light. The ION even comes with a special inscription on its back, celebrating the company's decade of excellence and thanking its highly valued customers! The ION is equipped with 2 top-of-the-line CREE LEDs, which combine to produce anywhere from 1 to 320 Lumens of cool white light. In addition to its easy to use ON/OFF side switch, the sophisticated keylight is operated using a pair of pressure sensor switches on its body. Simply press the plus or minus symbols on the ION's gorilla glass body to cycle between its 6 unique outputs. This one-of-a-kind advanced interface has never been seen before in a flashlight, making this device all the more impressive. Every aspect of the Olight ION is unique, its power source included. Rather than rely on separate batteries that need constant replacing, this handy keylight comes with a built-in Lithium Polymer battery pack, which can be recharged through the light's micro USB charging port. As you use the light, you can keep track of just how much charge is left thanks to its LED power indicator, located in between the light's pressure sensor switches. While the light is on, the indicator will glow either green, yellow, or red to signal how much juice the battery pack has left, so you'll never be surprised by a dead battery! ● This flashlight has a rectangular structure, one-of-a-kind gorilla glass body with titanium frame. ● Thanks to the dual LEDs and TIR optic lens, the ION has a soft, balanced beam profile with a wide defined hotspot and wide angle spill light, that is capable of a maximum output of 320 lumens and a beam range of up to 55 metres. ● There are pressure sensors in the “+” and “-” areas which allow the user to select either preset brightness levels or a gradual custom brightness setting. ● Built-in rechargeable LiPo battery can be charged through the micro USB port located on the side of the flashlight, it only takes 1.5 hours for a full charge. ● First flashlight in the world that controls the output through built-in pressure sensors under a glass control panel in a 1mm thin frame. ● Easy to operate, single press to select from four preset brightness levels, or press and hold for a custom output, ON/OFF slide power switch located on the side for quick power control. ● Remaining battery power indicator - green (>75%), yellow (15%~75%) or red (<15%), charging status indicator: red (charging), green (charging completed) both positioned on the "O" letter on the center of the panel. ● "10th Anniversary Edition" inscription on back, Zero in inscription doubles as a LED power indicator. ● A front and back tempered glass screen protector is included to protect the glass panels from damage whilst the metal ring on the tail can be connected to the included key chain for simple and convenient carry. The Acebeam T36 is a dual switch tactical LED flashlight equipped with a Cree XHP35 HI LED, features 5 brightness levels plus a strobe mode and powered by single rechargeable 21700 Li-ion 5100mAh battery. The Acebeam T36 delivers an output range of 2 lumens to 2000 lumens with a beam distance of up to 303 meters. Equipped with a built-in USB-C charger makes charging convenient and up to 3 times faster than normal USB charging. The innovative side switch allows quick and easy selections to all available lighting modes. The aggressive strike bezel and dual switch operation make the Acebeam T36 an ideal flashlight for self-defense and every day carry. ● Aircraft grade aluminium body structure to withstand harsh environments. ● Premium Type III Hard Anodised anti-abrasive finish prevents scratches. ● Ultra-clear tempered glass lens with anti-reflective coating can be used in the toughest of conditions. ● Tactical strobe mode disorients an attacker without excessive force, therefore keeping a user at a safe distance away from an assailant. ● Smooth reflector creates a far-throwing, tight beam. ● Tactical knurling for firm grip, even when wearing gloves. ● Acebeam T36 flashlight adopts dual switch design to accommodate different scenarios and user preferences. ● Intelligent highly efficient circuit board design for max. performance and long time time. ● Tactical ring maintains a comfortable grip, also prevents rolling on a table. ● Built-in charging indicator notifies a user when a battery is fully charged. ● Battery adapter allows for the use of an 18650 if desired. ● Rubber cap for fully waterproof and dustproof, submersible to 5 meters. ● Specially designed for military, law enforcement, self-defence, hunting, search & rescue and outdoor activities.